Today Jill of L'Ocassion invited the Italian Food Wine Travel bloggers to focus on the wines of Italian islands. You can read her invitation and join in the conversation if you're seeing this early enough. We gather on Twitter on Saturday, April 6th at 8am Pacific time to share our thoughts and pairings. Or just check out the hashtag - #ItalianFWT - at your convenience. 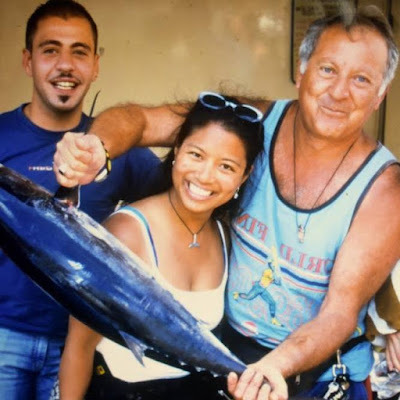 Steven from Steven's Wine and Food Blog features Sicilian Pasta con le Sarde Wine Pairing. Nicole from Somm's Table crafts A Passion for Sicily with Passopisciaro: An Interview with Sarah H. Bray, Part 1 and Part 2. While visiting the great cities in Italy probably tops many people's lists - yes, I was more than a little of envious of my son's recent trip to Italy and Greece during his Spring Break last month! - it's the surrounding islands that are seared into my dreams. During the year that I lived in Rome after college, I traveled when I wasn't working. I hopped across the islands in the Venetian lagoon and spent my twenty-fourth birthday weekend camping above a beach on Costa Smeralda, Sardegna with one of the other au pairs. 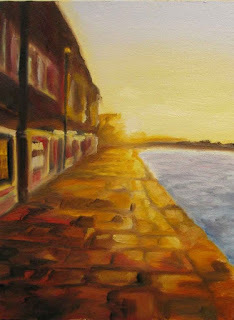 During Spring Break of 1997, I traveled to Venice on my own and stayed for a few days in the convent on Giudecca. My husband was intrigued by the photographs I took during my stay in the Venetian lagoon and created these paintings of Torcello (left) and Giudecca (right). Two very different feels from two very different islands. These began as pochades (French for "rough sketch") from my photographs, then transitioned into complete works of their own. But it's the slightly longer trips that have me longing for those sun-kissed islands that smelled of citrus, salt, and cypress trees. For no other reason than that I could, I boarded an overnight train from Termini (Roma) and took it all the way to Milazzo, Sicily where I hopped on the ferry around the Aeolian islands. I had read about Vulcano, and planned to get off the boat there; but, honestly, it reeked of sulphur, so I stayed on the ferry until we circled Lìpari, the largest in a chain of islands in a volcanic archipelago situated in between Vesuvius and Etna. I rented a cottage on a family's farm in Lìpari and was able to see them putting up a tomato harvest for the year. Truly amazing. You can read about that in my Under a Full Moon on Lìpari + Passata di Pomodoro post. Then, a few years later, I returned to Sicily with my husband and some friends and family. We stayed in Palermo for a couple of days and, then, we were stranded on Ustica, an island off the northwest coast, for a week. I write 'stranded' because we had only planned to be there for two days; but storms came in and no boats were returning to Palermo. That was one of my favorite travel delays. We had rented a house from a man named Antonio who left us fresh herbs and fresh eggs during our stay. Before Ustica, I had never seen capers growing in the wild. Now capers are something I always have on hand. They add a nice pop of saltiness to salsas and salads. And I will never forget how Antonio gave me a jar of home-cured capers to take with me. "Per te," he said. "Prendilo a California." For you. Take it to California. I may or may not have slapped a commercial label on the jar and brought them back to California with me. Maybe that happened...I'm not really saying. I searched and searched to see if I could find a way to get my hands on the only wine I found from Ustica: Hibiscus. Still trying! But, until then, I was able to get a few bottles of Cannonau Di Sardegna. Cannonau is the Sardinian name for Grenache. As a wine-producing region, Sardinia has languished in relative obscurity for years. But it’s coming into its own. 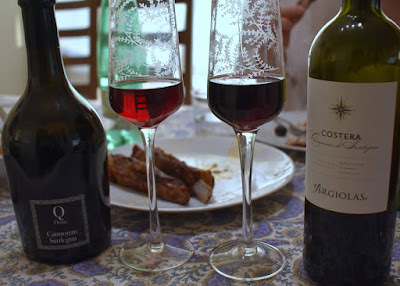 I tracked down two different bottles , but am focusing this post on the one that we thought paired best with the meal. The other bottle was fine, too, but it was a little bit more tannic and not as friendly with the lamb. 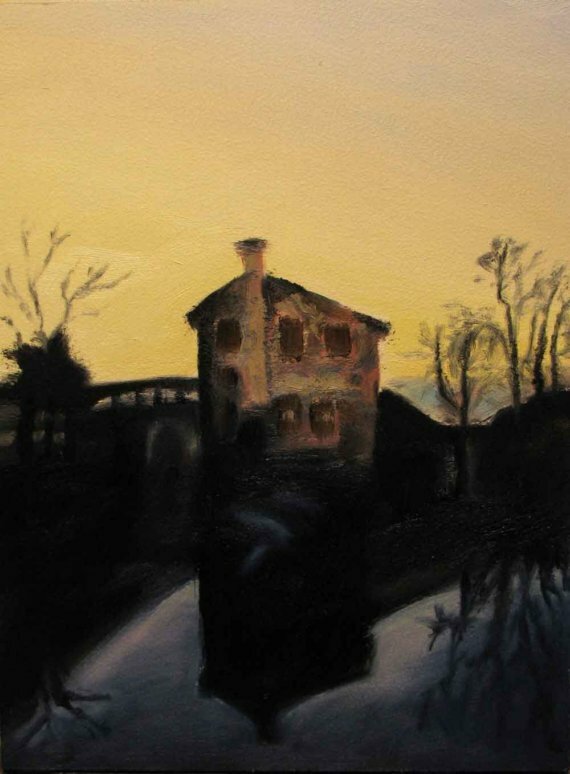 Piero Cella, who started his tiny Quartomoro label as a side job, is part of that renaissance. An enologist, he has worked all over Sardinia, documenting soil types and grape varieties. He sources grapes from different growers in the regions and they work together on how to grow the grapes organically and how to express the terroir of the grapes and the growers' vision of the resulting wine. Cella dreams of employing classic continental winemaking methods without losing characteristics of its local origins. The 2016 Quartomoro Cannonau Di Sardegna 'Orriu' is an example of Cella's dream. The wine is classically Sardinian, lacking the over-ripe flavors common in Cannoanu. The wine is crisp, clean, rife with fruit and layers of complexity. On the nose, I got an intriguing blend of subtle flowers, Asian spices, and black fruits. On the tongue, the wine is well-structured and balanced with notes of pine, herbs, and berries. The finish circles back with some delicious spice. And though Sardinia is an island, much of their traditional foods are not seafood! It's somewhat of a contradiction - an island civilization that did not utilize seafood in its diet - but it makes sense. Since Sardinia’s coast has always been prone to invasion, the Sardinian people found refuge in the mountains. Therefore, the traditional foods of Sardinia were always more influenced by the land than the sea. Today, however, with fear of invaders and pirates gone, Sardinians have embraced seafood and enjoy many seafood dishes, including seafood fregola with saffron, spaghetti with sea urchin, bottarga, and octopus salad. However, based on their traditional mountain cuisines, I opted to make lamb. And I served it with Israeli couscous to simulate Sardinian fregola sarda. Mix together the garlic, red wine, lemon juice, honey, olive oil, cinnamon, oregano, rosemary, salt, and pepper to form a marinade. Place the ribs in a rimmed dish and pour the marinade over the top. Let marinate overnight, if possible, turning the ribs halfway through. When you are ready to cook, remove the ribs from the fridge and let come to room temperature. Preheat the oven to 225 degrees F. Remove the ribs from the marinade and place fat-side up on the rack over a roasting pan. Roast for 3 to 4 hours, until the fat has rendered and browned and the meat is well done. Because they are on a rack, I didn't turn them at all. 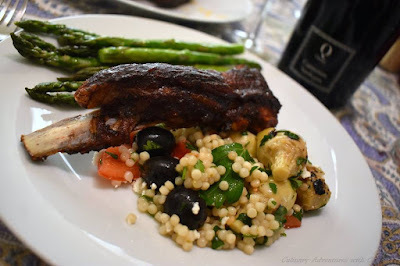 Serve with roasted asparagus, a green salad, and fregola sarda, if you can find it. Israeli couscous was a decent substitute. Looking ahead, we head to the Marche with Lynn of Savor the Harvest as she leads the discussion on the Pecorino grape. I had always thought that referred - only - to cheese! I'm looking forward to learning more from this group. Cin cin. what an article! )) I made a break to get some food to finish reading it! Thanks! Yes, it was a long post. Not Odyssey long, but long nonetheless. Thanks for sticking it out with me. What a lovely blog with great travel memories! 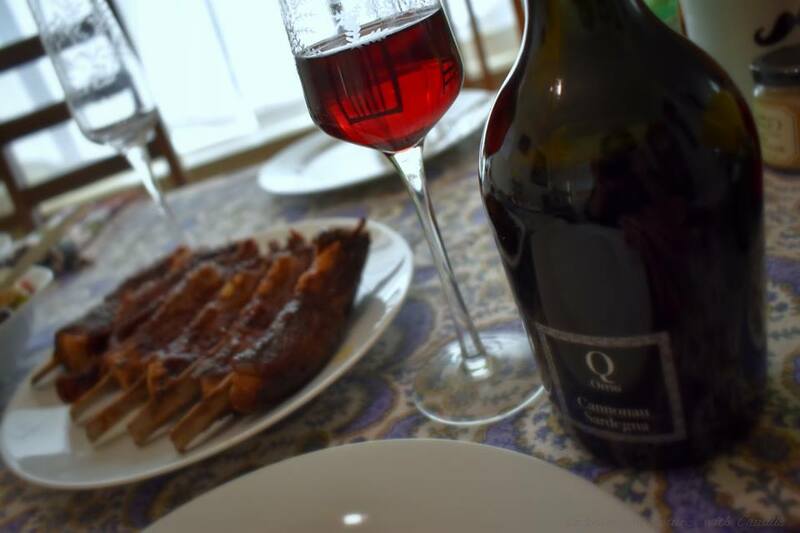 The 2016 Quartomoro Cannonau Di Sardegna 'Orriu' seems to be a great pair with the lamb ribs which simply look irresistible! Thanks, Pinny. Yes, it was a lovely pairing. I was going to start with great post and thanks for sharing the recipe...but hold up...Jake paints and fixes stuff! Wow!...Okay back to what I was saying. I need to make these lamb ribs...might try to smoke them. I haven't tried a Cannonau Di Sardegna yet, but you've certainly piqued my interest in doing so! Haha! Yes, he paints. Not so much anymore. He's more into wood and metal these days. But, definitely a Jake of all trades. Sorry for your loss, Jen. Yes, I had some fun travels in my youth...because now I'm ancient, as my kids tell me! LOL. Thanks so much for sharing this piece of your life with us. What an after college experience you had. Too funny about Vulcano reeking of sulfur! Piero Cella sounds super interesting, as does his Quartomoro label and the Cannonau. Be fun to read about his work on soil and grape varieties although to find in English could be challenging. Cheers Cam! I loved this post! From your memories of trips past to Jake's paintings and the fabulous recipe, it was a total experience rather than just an article. Thanks for a very enjoyable virtual voyage! Looks like a delicious pairing! And love the photo memories and painting. Enjoyed reading about your amazing travel memories and interesting take aways. It makes sense that earlier they retreated to the mountains and animals were more of their diet vs. seafood. Your meal and wine pairing look and sound delicious! !